Every once in a while, you’ve got to take a chance on a long shot, and hope for something remarkable to happen. Like the time I tried internet dating and went out with the girl who only provided pictures of herself from the neck up. That time, I was on the losing end of the stick. (Thankfully, much like the pain of a gambler who bet heavy against the odds, my pain was dulled by the wonders of the magic elixir we call alcohol.) Today, however, I took a shot on a little comic book convention Hayward, California… and won. Let me sum up Hayseed for you: Gun shop. 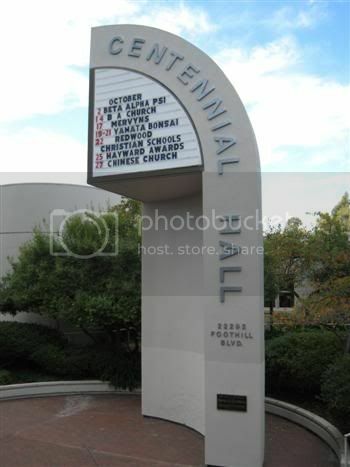 Christian Bible Emporium. Taco Bell. There. I’ve painted quite the picture of little ol’ Hayward, haven’t I? If I was feeling all ironical, I might call it the Mecca of Sophistication. And if you saw the home page for the Hayward Comic-Con (oh, and you should go take a look), you’d see that the convention itself struck quite the resemblance to its host township. I wonder who took home the Shiniest Pickup Truck prize at the Hayward Awards? 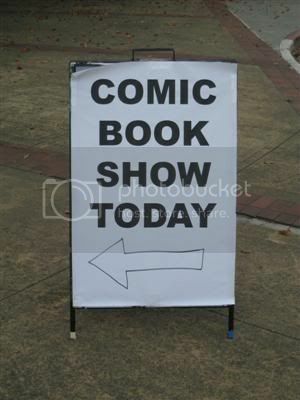 To add insult, there were no costumed fans to photograph, contrary to propaganda on the Hayward Comic-Con home page. First, the guys at the admission desk were handing out props from an upcoming episode of Numb3rs, a formulaic CSI-knockoff on CBS that I don’t need to have watched to know that I don’t want to watch it. (You know what I mean.) Anyway. On the November 23 episode, Numb3rs in some way involves comic books. It’s at a comic book store, or some comic book nerd is killed, or something. I don’t know. The details don’t matter. What does matter is that instead of licensing actual comic books to use as props, the show had to commission artists to create cover artwork for imaginary titles. 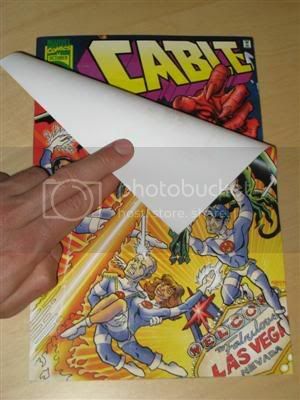 Then the prop guys literally glued the quite-impressive fake covers to the fronts of actual comic books. 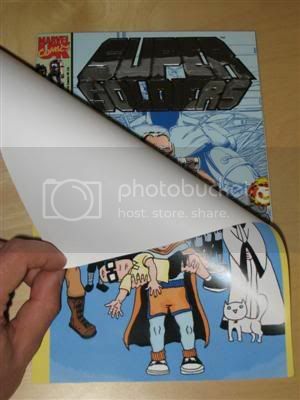 And here’s the fun part, for us comic book geeks: figuring out which real comics were considered inconsequential enough to ruin with a slathering of glue. (Any comic book geek will tell you that he instinctively protects even his most financially worthless books.) Victims included Super Soldiers (giggle), a Marvel UK title that’s just as bad as the title suggests. Cable, a spinoff book about one of Marvel’s (formerly?) popular mutant characters. And Youngblood, a spectacularly bad book that was one of the flagship titles of Image Comics, a publishing company that formed when a bunch of talent left Marvel to do their own thing. According to the guys at the admission desk, the comics happened to be whatever were sitting around in a dealer’s 25-cent bin. But fanboys will appreciate that Rob Liefeld seems to be the common link among these titles that were deemed appropriate for abuse and ruination. 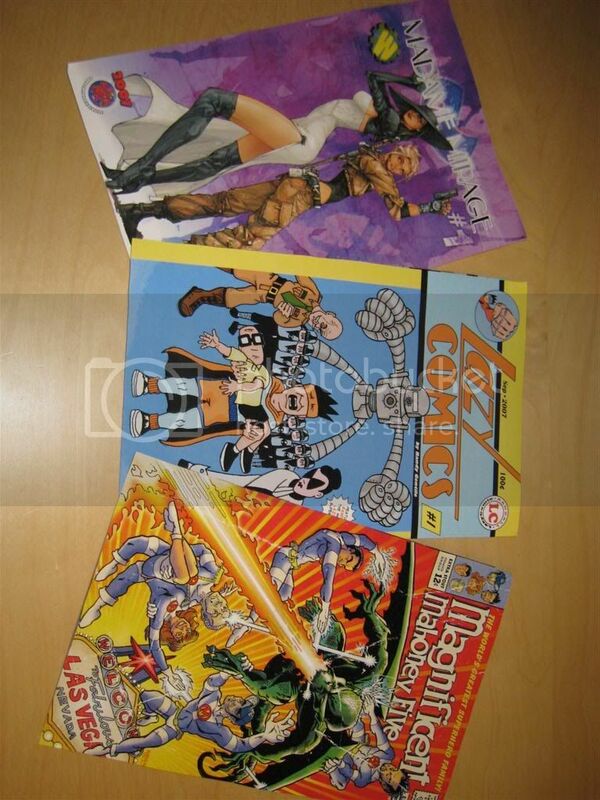 For whatever reason (Google it), Liefeld is widely considered to be somewhat of a douche. He created Youngblood, was the first artist to draw Cable back in New Mutants, and was obviously the main influence for the hack who drew Super Soldiers. Even if it’s a huge coincidence, I love that the upcoming episode of Numb3rs just might be some geek’s insidious dig at some big-mouthed artist/writer/publisher who doesn’t happen to draw, tell stories, or publish particularly well. Oh, and also? I met Darth Vader, today. Boo-yah. * I’ve clearly been spoiled by modern super-conventions, like San Diego’s Comic-Con. This Hayward con is exactly like the ones in Holiday Inn ballrooms that I used to enjoy when I was a kid. Comic books, and nothing but comic books. Hey where’s my credit for turning you on to such an awesome place? !